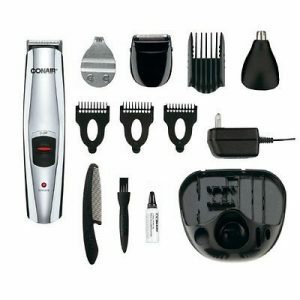 If you are looking for a multi-use professional trimmer than the Conair GMT 189 GB is the right choice. It comes with 13 pieces of attachments an it is a top-selling product of this company. If you do not want a corded one from Conair such as the model GMT8RCS, you can always opt for a rechargeable and cordless one from them. It is silver in color with all the attachments being black in color. It comes with a little bottle of oil which white with the name of the company on top of it. It comes with all the combs you will need, cleaning brush and the charger. Even though the trimmer is silver in color, there is a red button and a charging indicator with the same color. The area surrounding the switch is black. It comes with an ear or nose hair trimmer. It is light-weight and long in size. It is 10.5 inches long which enables you to use it for multi-purpose. Even though many beard trimmers utilize lithium ion, this one uses nickel metal hydride. Although both types of batteries are tough and both come in use for ages in numerous applications, durability and strength is the area where nickel metal hydride has a plus. The lithium ion battery does not last as long as them even though experts are trying to improve them. They both have similar power but the Lithium ion can lose power fast. When it is about cost, the nickel one costs less thus the price of the beard trimmer is also affordable. The best part about Conair trimmers is that they last more than a decade unlike many other brands that takes huge amounts of money for the trimmer. It comes with detailing blade, 3 jawline combs, shaving foil, 5 position combs, ear and nose hair trimmer, cleaning brush, adapter, mustache comb, storage pouch and lubricating oil. You can get a proper trim with this device. The blades do not rust and you will feel like they are brand new. The 5 position guide attachments allow you to pick the length of the beard. After your trimming session is over, you can keep everything on the stand that comes along. If there is something you do not understand such as putting in the shaving foil, read the manual. It comes with all the instructions you will need. Changing heads can be a difficult task for you if you do not know how to do it. The motor is the reason why the device is so powerful. You can use it for your ear and nose hair as well along with the beards and mustache. Do not worry if it heats up because it will. If you have a problem with that, you can always opt for the corded one from Conair which does not heat up. You also have to be careful when you keep all your accessories in the stand because a small push can make all of the tools flying around because the base is not substantial. This entry was posted in Conair on February 3, 2019 by Professional Beard Trimmer Reviewer.